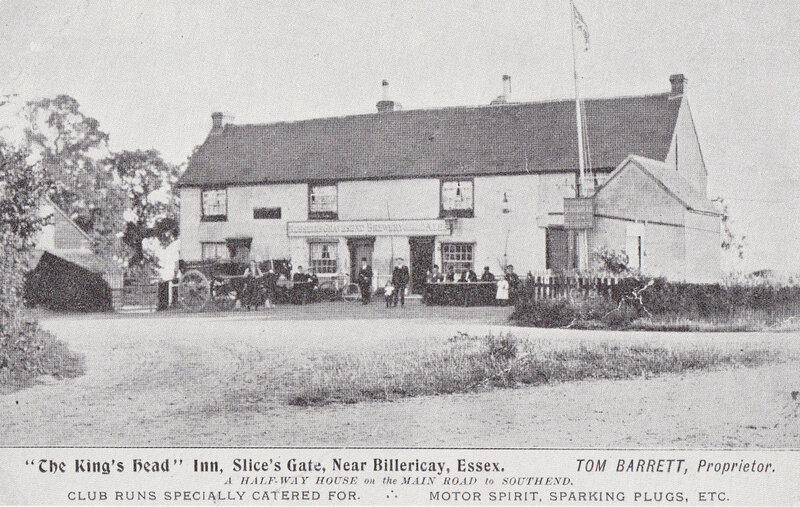 The postcard above shows the Kings Head in Southend Road from Coxes Farm Road, Billericay is off to the right. This postcard would have been a method of publicity for the pub and advertises that they sell motor spirit (petrol) and spark plugs to service the few motor vehicles that would have passed by. The card also makes reference to the pub being a halfway house on the Southend Road and would have catered to passing charabancs on their way to Southend before WW1. If you look closely you can see that the pub sold beers from Russell’s Gravesend Brewery. This postcard has brought memories back to several of our older viewers still living in South Green area.